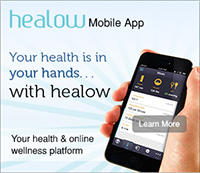 Grab the Health and Online Wellness – healow – app available for iOS and Android. healow is a secure app that helps you manage what’s important – the health of you and your family! Access your and your family’s health information with a single app. Juggling multiple provider accounts and patient portals can be confusing and time-consuming. Use healow to link all of your providers together in a single location. One username and one password is all you need to obtain access to all of your provider accounts for yourself and your minor children. And with their consent, you can even manage the accounts of your spouse or aging parents. Gain the peace of mind that comes from knowing your family’s important health information is at your fingertips! Book instantly for FREE at your convenience. Book your appointment fast, free & easy, at your convenience – morning, noon or late at night! No more waiting on the phone with your doctor’s office for an appointment. Find an appointment that works for you and book instantly. healow contains all of your important health information, including labs, imaging studies, and procedures, recent vital signs, allergies, medical problems, immunizations, and more. Having access to this information puts YOU in control of your healthc.